The ad itself is not about shaving, though most of the men in it are clean-shaven, but about the difference between being a jerk and behaving like a decent human being. It is unusual for a company to use their advertising dollars to say something reasonable (rather than just pushing product)—unusual enough that they are getting far more coverage for their ad than they would have for a similar amount spent on a more conventional ad. Despite the reasonableness of their ad, I won’t be changing razors, though. 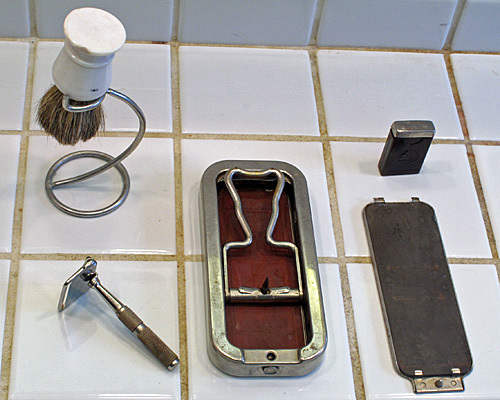 I use the Rolls Razor that my father brought with him from England around 1950—it still works fine and I expect it to continue to do so for rest of my life. My father’s razor still serves me well. The whetstone and strop in the steel case are still in good shape after about 70 years. There is even a spare blade, should I get tired of the current one. At one point I considered giving it to my son, but instead I bought him his own Rolls Razor. Even though they haven’t been made since the 1960s, I found one on eBay that was about the same price as when it was new (in the late 1930s or early 1940s)—which really means it was a tiny fraction of the new price, given the rate of inflation since then.